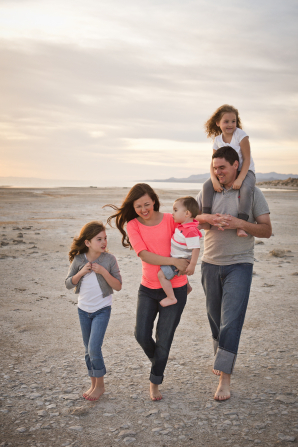 Modern Mormon Answers: Family: The most important part of your life!! It is so true that Satan is attacking our families. It seems like I see it every day. It's comforting to know that we can pray to our Father in Heaven and ask for help. He is our father and He does know our hearts. In a confusing and troubling world, it's a blessing to know that we have a loving Heavenly Father that wants us to be happy and wants our families to be happy. What a powerful message! I can read and reread this article and learn something different. I love it. My mom, being a convert to the church, broke many traditions and bad cycles. My dad was the only one of his 5 siblings to follow the righteous examples of his parents. Because of their choices, they are the only ones in their family that have stayed faithful to each other, have been blessed with children who have obtained education, and have been financially taken care of. I see these blessings from our Heavenly Father because my parents chose to live righteously. I hope I can always be the generation that followed the righteous examples of my parents. Thank you for sharing your wisdom and your sweet spirit. It has touched my heart and my mind. "If you've been unkind in the past, be kind from now on..." I love this. We can't change what we've done in the past, or who we were. We can change what happens in the future. We should feel sorrow for what we have done, but we shouldn't dwell on the negative, instead we should do good things and things we won't look back on and wish we hadn't done. Now is always the best time to change. This is so true. While I have come from a fairly "normal" family there are still things that I have seen and experienced that I know I want to change and do differently with my own family. I am striving to break some of those not ideal behaviors and replacing them with more harmonious ones. Just because we have been given certain examples does not mean that we have to follow them if they do not align with the teachings of Christ or we know to be right. We can take a different path and set a new example that is better for our posterity to follow in the end. There is never a bad time to change only an unwillingness. Thank you for that article. I love the part about the cycle breakers in your lineage. Families are always evolving, either toward the light or away from it and it's our job to try to keep our's going in the right direction. I love especially the title of this article that family is the most important part of your life because this is very true for me. Even though things like our careers and personal accomplishments are important for our individual development and providing the physical necessities of life, in the long run it's our families that are the most important and the development of those relationships that will ultimately matter most to us.